This picture shamelessly stolen from their Facebook page. Despite the fact that I really want to spell it bahgeddaboudit, I can’t resist a food truck with a good pun for a name. A good bun, in this case, too. Baguetteaboutit is one soldier in the Triangle’s army of food trucks, and I’ve had their sandwich rolls twice now. The first time was in Raleigh the night that the Natural Life and Science Museum opened their new wing. The second time was at lunch during the Sustainable Classroom at TerraVITA in Chapel Hill. Unlike some food trucks, they don’t appear to have a regular schedule of locations. They seem to move on to greener pastures pretty much every day, which I imagine is good for getting more people exposed to their inventive food. That food is simple: a french baguette hollowed out so a sausage can be shoved inside of it along with some sauce. That’s all it is, but the combinations cover a vast spectrum of global cuisine. Chicken spinach sausage with tzatziki sauce? Bratwurst with mustard? You bet. 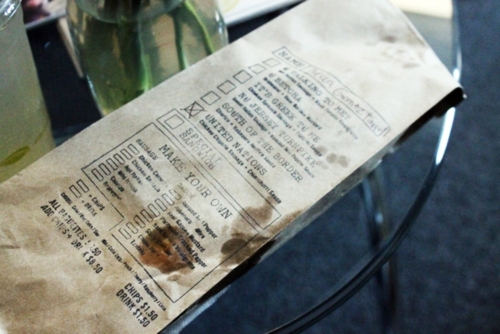 They manage to make the experience of ordering fun, too, through the use of cute paper bags the sandwich rolls are delivered in and ordered on. The grease spots make it look more appetizing, right? They have eight different combinations of sausage and sauce, or you can make your own flavor explosion. And I do mean explosion. So much so that the first one I tried, the South of the Border, was too much heat for these taste buds. I love spice, adore it! I’m proud of my ability to amaze most men with the amount of hot wing heat I can stand and my willingness to use habaneros when making a Mexican dish. I even chop them without gloves! But the habanero hellfire sauce on this roll blew me away. I can’t even remember the taste of the chorizo beyond noting it was Spanish-cured and thus harder than crumbly Mexican chorizo. I’m not sure I can recommend it, because all I remember is valiantly eating my way through the large roll because my husband couldn’t take that heat. I also found the roll dry despite the hellfire sauce. The United Nations is a much safer, delectable bet. And it still has kick! 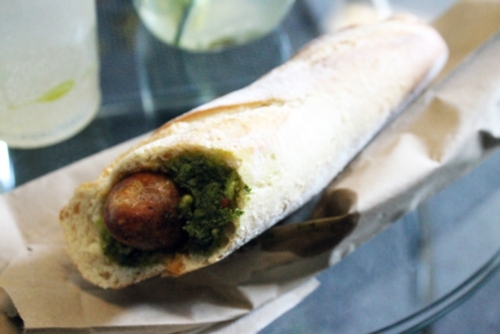 The sausage was chicken chipotle, which had a smoky kick that the effervescent, citrus chimichurri sauce softened. There was lots of garlic in both the sausage and the sauce. It went remarkably well with the lime soda I purchased to wash it down. Let me be real, the novelty of Baguettaboutit is enough for me to recommend this food truck on its own. Yes, the South of the Border exceeded my heat tolerance, but I know some of you enjoy challenging your taste buds as well, so I can’t really call it a demerit. Perhaps adding a creamy element to that roll would make it much easier to take. The United Nations was perfect as it was, and I’m sure the other combinations provide their own fun experiences. Reviewed 2 Nov 12 and sometime last summer. Thanks! I am a sucker for good marketing. I admit it openly.